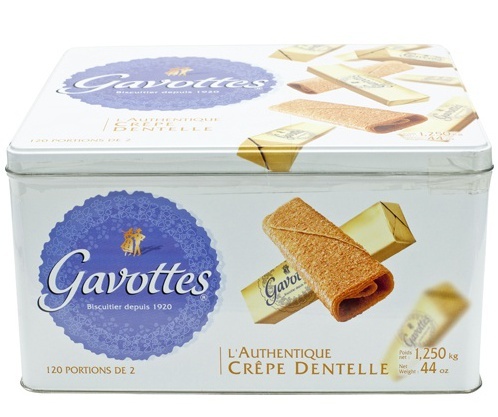 The authentic Gavotte crêpe dentelle is a fine crispy biscuit that has been made following a recipe handed down since 1920. A box contains 120 portions of 2 Gavottes. Wheat flour; Sugar; Concentrated butter; No modified and/or hydrogenated vegetable fats (coconut oil, palm kernel oil); Lactose and milk proteins; Salt; Barkley malt flour; Raising agent: hydrogen carbonate; Soya lecithin. Gavottes crispy Crêpes Dentelle go wonderfully well with champagne, desserts, ices, tea or coffee but are also great just on their own, crunching in the mouth and delighting your taste buds with their aroma, flavour and unique crispiness.